"I worry no matter how cynical you become, it's never enough to keep up." Jane Wagner, one of America’s most distinguished playwrights, has won numerous awards, including: several Emmys for writing and producing and a Writer’s Guild Award for her work in television. Wagner has also won a New York Drama Critics’ Circle Special Award and a New York Drama Desk Award for her Broadway success, The Search for Signs of Intelligent Life in the Universe; a CableAce Award for Executive Producing the film adaptation of The Search; three Grammy nominations for comedy albums she wrote with Lily Tomlin, Modern Scream, And That's the Truth, and On Stage; and two Peabody Awards--the first for the CBS television special, J.T., and the second for the ABC television special, Edith Ann’s Christmas: Just Say Noël. Early Life. Wagner was born and raised in Morristown, Tennessee, where she enjoyed writing at an early age; by the time she was in high school, she was also drawn to the theater. Early in her professional career, Wagner toured as a leading actress with the famed Barter Theatre of Abingdon, Virginia. Wagner moved to New York City where she auditioned for acting roles in the New York theater and studied painting and sculpture at the School for Visual Arts. She later established herself as a designer for such firms as Kimberly-Clark and Fieldcrest; her most creative designs included the innovative “Teach Me, Read Me” children’s bed sheets. These creations, along with other textile designs of hers, have been exhibited at the Brooklyn Museum of Art. Television and Albums. Wagner made her writing debut with the highly acclaimed CBS teleplay entitled J.T (1969), a special for which she won the coveted Peabody Award. Her book of the same title was published in both soft and hardcover editions. It was J.T. that brought Wagner to the attention of Lily Tomlin, who was seeking the help of a writer for her television character, the precocious Edith Ann. Tomlin was impressed with the humanity and depth of Wagner’s writing and felt that Wagner would bring similar depth to Tomlin’s comedic characters. At the same time, Wagner was interested in expanding her writing to include comedy. They began working together on an Edith Ann album, Edith Ann: And That’s the Truth (1971), which began an award-winning, creative alliance that has lasted for over forty years. They went on to co-write and produce two more Grammy-nominated albums, Modern Scream (1975) and On Stage (1977). From that time on, Wagner ventured further into television productions with Tomlin, writing much of the material with which Tomlin is identified in her television and stage career. 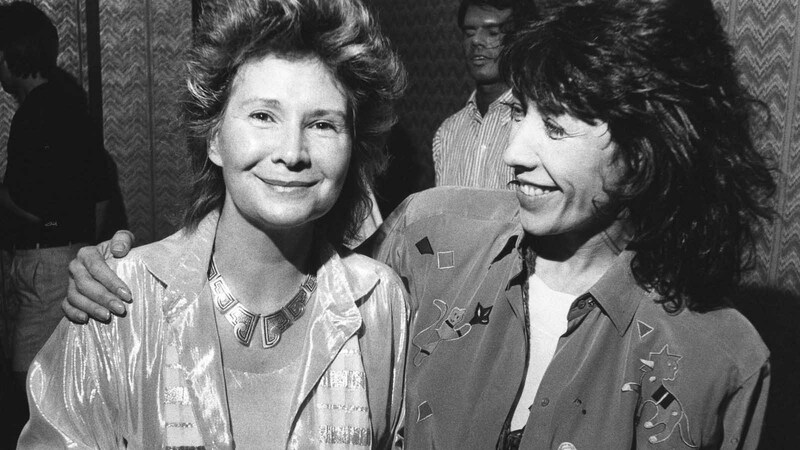 Together, they produced six comedy television specials: The Lily Tomlin Show (1973), Lily (1973), Lily (1974), Lily Tomlin (1975), Lily: Sold Out (1981), and Lily for President? (1982), for which Wagner won three Emmy Awards and a Writer’s Guild of America Award. Wagner then wrote and executive produced three animated television specials starring the precocious six year old, Edith Ann, whom Tomlin made famous on the hit television show, Laugh In. The first special, Edith Ann: A Few Pieces of the Puzzle (1994), aired on ABC to critical raves and excellent ratings. This was followed by Edith Ann: Homeless Go Home (1996) and Edith Ann’s Christmas: Just Say Noël (1996). For this special, Wagner was honored with her second Peabody Award. In addition, her book, Edith Ann: My Life, So Far, was released by Hyperion Press in both hardcover and in paperback. She also produced, with Lily Tomlin, and wrote the narration for the HBO documentary, An Apology to Elephants, for which Tomlin received an Emmy Award for Narration in 2013. Movies. Wagner wrote and directed Moment by Moment (1978), a movie starring Tomlin as a bored homemaker involved in a romantic dalliance with John Travolta. In 1981, Wagner wrote the screenplay and executive produced the movie, The Incredible Shrinking Woman, a rollicking, dark commentary on our environmental concerns, in which Tomlin starred as a suburban mother “shrinking” as a result of her exposure to the ubiquitous toxic chemicals of our world. In 2003 and 2004, Wagner was the Creative Consultant on commercials featuring Ernestine as a global communications visionary for WebEx. Stage. In 1977, Wagner wrote and directed Appearing Nitely, a one-woman show in which Tomlin made her Broadway debut. In Appearing Nitely, Wagner included favorites such as Ernestine, Edith Ann, and Judith Beasley, the Calumet City homemaker, and also introduced Trudy, the bag lady; Crystal, the hang-gliding quadriplegic; Rick, the singles bar cruiser; Glenna, a child of the sixties; and Sister Boogie Woman, a 77-year-old blues revivalist. Wagner subsequently adapted Appearing Nitely as both an album (1977) and an HBO Special (1978). In 1985, Wagner brought her extraordinary play, The Search for Signs of Intelligent Life in the Universe, to Broadway, where it became one of the most critically acclaimed plays of the 1985-86 Broadway season. With her scintillating script, Wagner established herself as a unique artistic voice in the literary world. She was honored by the New York Drama Critics’ Circle with a rarely given Special Award for the SRO hit and was similarly lauded by the New York Drama Desk for a "Unique Theatrical Experience”. The hardcover edition of The Search earned the distinction of being the first play in twenty years to appear on The New York Times bestseller list where it remained for several weeks. Wagner also adapted the screenplay of The Search for an HBO film for which Wagner also wrote the haunting title song, We Are The Ones (1992). The Broadway theatrical success of the play was followed by a coast-to-coast, fourteen city tour that spanned four and a half years, a cross-country, twenty-nine city tour of The Search (1999), a new production of The Search on Broadway (2000), a record-breaking six months in San Francisco (2001-2002), and a highly praised, eight week run in Los Angeles (2003). Wagner’s play continues to be performed in the United States as well as other countries, such as Greece, France, and Austria by a myriad of artists. Lily Tomlin continues to perform in hundreds of venues across the States many of the classic characters she and Wagner have created through the years. In 2009, Wagner directed Tomlin's Las Vegas debut at The MGM Grand Hotel in a new show entitled Not Playing with a Full Deck,, and also directed Tomlin in her return to the MGM Grand in 2010. Wagner is currently working with production teams on new stage and cinema projects, including a movie based on the Beebo Brinker Chronicles, one of the most popular pulp fiction series of the 1950’s, and a new play scheduled next year for Broadway based on Sarah Waters’ novel of the same name, Fingersmith. Wagner is also a founding member of the popular website for women, www.WOWOWOW.com, and participates with other celebrities such as Whoopi Goldberg, Candice Bergen, Liz Smith, Lily Tomlin, Peggy Noonan, Marlo Thomas, and Lesley Stahl to create an on-line community which is owned and run by women for women of all ages and origins. Wagner has also created a new game app for social media, City Adventures of Edith Ann, based on her beloved character, Edith Ann. In 2012, Harper Collins issued a new release of the book, The Search for Signs of Intelligent Life in the Universe, to celebrate twenty-five years in print. Wagner has contributed her writings and drawings to Lily Tomlin and Jane Wagner’s website--www.lilytomlin.com. On New Year's Eve 2013, Wagner and Tomlin were married in a private ceremony. Wagner was born and raised in Morristown, Tennessee, where she enjoyed writing at an early age; by the time she was in high school, she was also drawn to the theater. Early in her professional career, Wagner toured as a leading actress with the famed Barter Theatre of Abingdon, Virginia. Wagner moved to New York City where she auditioned for acting roles in the New York theater and studied painting and sculpture at the School for Visual Arts. She later established herself as a designer for such firms as Kimberly-Clark and Fieldcrest; her most creative designs included the innovative “Teach Me, Read Me” children’s bed sheets. These creations, along with other textile designs of hers, have been exhibited at the Brooklyn Museum of Art. Wagner made her writing debut with the highly acclaimed CBS teleplay entitled J.T(1969), a special for which she won the coveted Peabody Award. Her book of the same title was published in both soft and hardcover editions. It was J.T. that brought Wagner to the attention of Lily Tomlin, who was seeking the help of a writer for her television character, the precocious Edith Ann. Tomlin was impressed with the humanity and depth of Wagner’s writing and felt that Wagner would bring similar depth to Tomlin’s comedic characters. At the same time, Wagner was interested in expanding her writing to include comedy. They began working together on an Edith Ann album, Edith Ann: And That’s the Truth (1971), which began an award-winning, creative alliance that has lasted for over forty years. They went on to co-write and produce two more Grammy-nominated albums, Modern Scream (1975) and On Stage (1977). Wagner wrote and directed Moment by Moment (1978), a movie starring Tomlin as a bored homemaker involved in a romantic dalliance with John Travolta. In 1981, Wagner wrote the screenplay and executive produced the movie, The Incredible Shrinking Woman, a rollicking, dark commentary on our environmental concerns, in which Tomlin starred as a suburban mother “shrinking” as a result of her exposure to the ubiquitous toxic chemicals of our world. From that time on, Wagner ventured further into television productions with Tomlin, writing much of the material with which Tomlin is identified in her television and stage career. Together, they produced six comedy television specials: The Lily Tomlin Show (1973), Lily (1973), Lily (1974), Lily Tomlin (1975), Lily: Sold Out(1981), and Lily for President? (1982), for which Wagner won three Emmy Awards and a Writer’s Guild of America Award. Wagner then wrote and executive produced three animated television specials starring the precocious six year old, Edith Ann, whom Tomlin made famous on the hit television show, Laugh In. The first special, Edith Ann: A Few Pieces of the Puzzle (1994), aired on ABC to critical raves and excellent ratings. This was followed by Edith Ann: Homeless Go Home(1996) and Edith Ann’s Christmas: Just Say Noël (1996). For this special, Wagner was honored with her second Peabody Award. In addition, her book, Edith Ann: My Life, So Far, was released by Hyperion Press in both hardcover and in paperback. In 1977, Wagner wrote and directed Appearing Nitely, a one-woman show in which Tomlin made her Broadway debut. In Appearing Nitely, Wagner included favorites such as Ernestine, Edith Ann, and Judith Beasley, the Calumet City homemaker, and also introduced Trudy, the bag lady; Crystal, the hang-gliding quadriplegic; Rick, the singles bar cruiser; Glenna, a child of the sixties; and Sister Boogie Woman, a 77-year-old blues revivalist. Wagner subsequently adaptedAppearing Nitely as both an album (1977) and an HBO Special (1978). The Broadway theatrical success of the play was followed by a coast-to-coast, fourteen city tour that spanned four and a half years, a cross-country, twenty-nine city tour of The Search (1999), a new production of The Search on Broadway (2000), a record-breaking six months in San Francisco (2001-2002), and a highly praised, eight week run in Los Angeles (2003). Wagner’s play continues to be performed in the United States as well as other countries, such as Greece, France, and Austria by a myriad of artists. Lily Tomlin continues to perform in hundreds of venues across the States many of the classic characters she and Wagner have created through the years. In 2009, Wagner directed Tomlin’s Las Vegas debut at The MGM Grand Hotel in a new show entitled Not Playing with a Full Deck,, and also directed Tomlin in her return to the MGM Grand in 2010. In 2003 and 2004, Wagner was the Creative Consultant on commercials featuring Ernestine as a global communications visionary for WebEx. In 2008, Wagner joined the newly launched website for women, www.WOWOWOW.com, and participates with other celebrities such as Whoopi Goldberg, Candice Bergen, Liz Smith, Lily Tomlin, Peggy Noonan, Marlo Thomas, and Lesley Stahl to create an on-line community which is owned and run by women for women of all ages and origins. Wagner has also contributed her writings and drawings to Lily Tomlin’s website–www.lilytomlin.com. Wagner is currently working on new stage, radio, television and social media projects: she has written the narration for the HBO documentary, An Apology to Elephants; she is working on a television series about several members of a bizarre and troubled family making good; and she has created a new game app for social media, City Adventures of Edith Ann, based on her beloved character, Edith Ann. In July 2012, Harper Collins issued a new release of the book, The Search for Signs of Intelligent Life in the Universe, to celebrate twenty-five years in print.